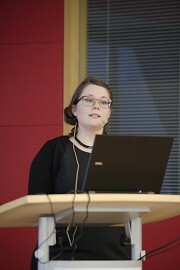 On 19 and 20 November 2015, the 50th Building Materials Day hosted by the Institute of Building Materials Research, Structural Preservation and Polymer Composites (ibac) was held at the SuperC, the RWTH Aachen student center with integrated congress facilities. This anniversary event was co-organized by BetonMarketing West (now InformationsZentrum Beton, IZB) and Bau- Überwachungsverein e.V. (BÜV). This year, Prof. Dr. rer. nat. 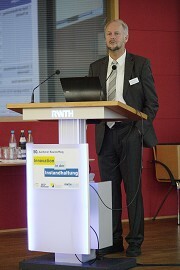 Oliver Weichold welcomed attendees, and his colleague at the institute, Prof. Dr.-Ing. 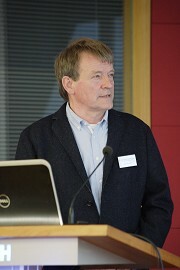 Michael Raupach, delivered the keynote speech. Dr.-Ing. Till Büttner, of Eurovia Beton GmbH, presented an innovative bridge repair system using textile-reinforced concrete. This system relies on the effect that carbon fibers not only absorb tensile loads but are also capable of conducting electricity. The textile fiber grid is primarily used as a network of sensors for remote monitoring purposes. If, during this computer-based monitoring process, any damage to the bridge is transmitted via data feed, a cathodic corrosion protection system can be activated directly. This project is still under development. Promising results were achieved for a small-scale demonstrator; these findings should soon be confirmed under real-life conditions. Concrete used for submarine structures is particularly prone to corrosion. Comprehensive research projects are currently underway at the Chair of Prof. Dr.-Ing. Frank Schmidt- Döhl of the Institute of Materials, Physics and Chemistry of Buildings at Hamburg University of Technology. To date, affected structural components had to be exposed and dried using sheet piling prior to their repair. Dipl.-Ing. 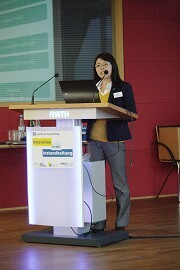 Lina Nguyen highlighted the issue of insufficient adhesion, i.e. detachment of freshly applied mortar caused by water turbulences that inevitably form during application of additional mortar. In her presentation, she compared various methods, including submarine high-pressure jetting, a specially designed sliding carriage for submarine plaster application, and manual underwater application using a trowel. Dipl.-Ing. Axel Dominik presented an innovation for the construction of floor slabs that is particularly well-suited to refurbishing existing buildings. Together with his cooperation partners, his engineering practice developed a novel lightweight concrete floor element. This precast component weighs only about 7 kg; it does not contain any additional reinforcement - neither steel nor carbon are used. The element's profile resembles the letter D tilted to the left. At their pointed corners, these elements are placed on double T beams whose lower chord is enclosed by a concrete shoe that is subsequently plastered together with the elements to provide a smooth underside. The cavity underneath the vault-like up¬per chord of the floor element is generally left empty, but can be filled with any insulating material if and when required. The speaker did not disclose the composition of the mix he developed, but conceded that the choice of the right binder and concrete aggregate was of great significance and that plasticizers were used in addi¬tion to pozzolanic constituents. The truly relevant fact, however, is that wood was used as an additional aggregate. Comprehensive tests showed that pre-wetted spherical wood chips yielded the best results. In experimental tests, calculated failure loads could actu¬ally be exceeded more than 2.5 times. In fact, a failure load of slightly over 5 t was assumed but initial cracks occurred only at an imposed load of about 20 t. Tests were then discontinued to avoid loading until final collapse of the structural element. Besides the enormous increase in tensile strength, the addition of wood considerably enhances the insulating performance of the non-insulated floor slab. In his presentation, Dipl.-Ing. Robert Schulte Holthausen referred to a current research initiative at ibac to apply liquid glass to concrete surfaces using a flame-spray process. This method should provide effective protection against corrosion, particularly under aggressive acid attack. However, the protective effect needs to be weighed against extremely high temperatures of significantly more than 1,300 °C that alter the physical properties of the concrete constituents considerably. Solution strategies are currently being investigated using various primers that are applied in a "cold" process prior to using flame-spray guns to heat extremely fine glass granules to liquefaction and to subsequently propel them onto the surface. Good results are currently being achieved with various types of soda waterglass. Elena Hess is conducting research at ibac on the polymerization in the pore space. In her initial remarks, she pointed out that there were not only standard concretes but also types of concrete that contain polymeric binders (Polymer Concrete, PC) as well as those impregnated with a low-viscous monomer (Polymer- Impregnated Concrete, PIC). Whereas PCs are very expensive whilst also significantly improving mechanical properties, PICs primarily increase the modulus of electricity. However, the latter type of concrete can only be used in precast elements because this impregnation process requires the entire precast element to be immersed in a bath. Whereas the morning of the second day included additional presentations on concrete repair, the afternoon session concentrated on hands-on exercises at five stations.